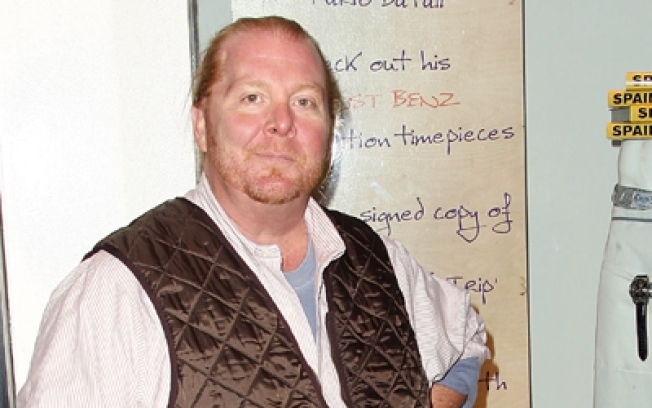 Mario Batali will hand out Starbucks coffee to passersby in Times Square to promote the (RED) charity this morning. Here's a way to make Black Friday shopping in Times Square just a wee bit less painful: Gothamist reports that starting at 10AM, Mario Batali will be stationed at military Island (that's where Broadway meets 7th Avenue between 43rd and 44th Streets), handing out cups of Starbucks brew to promote (RED), the agency that helps raise money to fight AIDS in Africa (any holiday drink purchase you make at Starbucks this month will also add 5 cents to the fund). Even better, at about 10:30 you can have your picture snapped with Batali's "helper elves" Helena Christensen and Mary Louise Parker in the (RED) photobooth nearby. All lovely and worthy, though if they're looking to soothe the nerves of shoppers coming from, say, the Toys R Us, we hope they have something a little stronger than coffee on hand.